Special Containment Procedures: When not in use, SCP-2626 is to be kept in a locked, padded storage container at Site 19. Staff may request permission to use SCP-2626 for research purposes by submitting a written proposal to the Level 3 supervisor, who must be physically present to supervise all use of the item. Negatives or photographic prints produced by SCP-2626 with unknown effects must be treated as potential Epsilon Class cognitohazards and may not be viewed under any circumstances until thoroughly tested on D-class personnel in a controlled environment. Negatives or photographic prints produced by SCP-2626 with known effects may be utilized for research purposes by personnel with proper clearance. All known negatives and photographic prints related to SCP-2626 are to be stored in the 19-2626 Document Storage Archive, organized by numeric ID prefix. Materials representing an Alpha or Beta Class cognitohazard must be sealed in clearly labeled opaque envelopes and may be removed in a controlled environment by personnel with Level 2 clearance. Materials representing a Gamma or Delta Class cognitohazard must be locked in designated, clearly labeled steel drawers and may be removed in a controlled environment by personnel with Level 3 clearance. Materials representing an Epsilon Class cognitohazard must be locked within two steel containers and may not be removed by any personnel under any circumstances without supervision and prior written approval from two Level 4 directors. 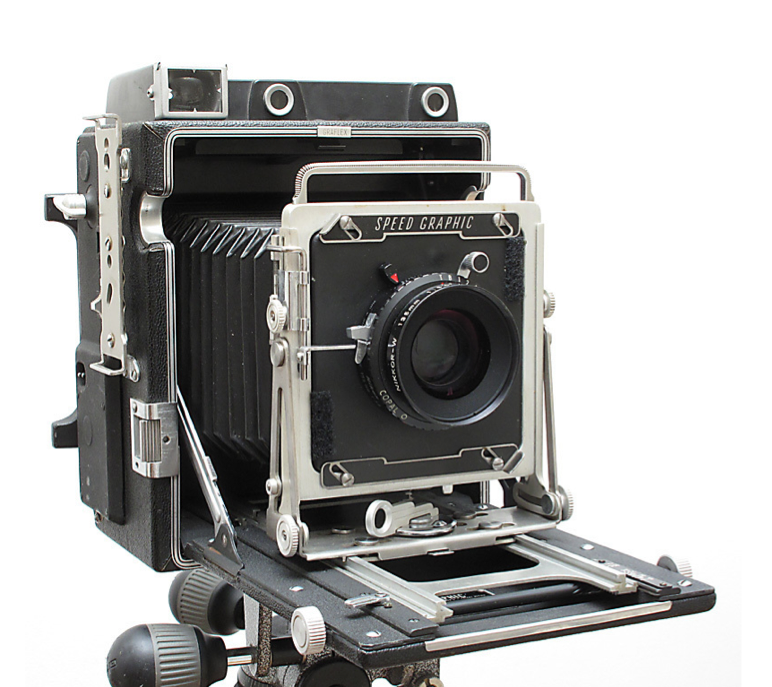 Description: SCP-2626 is a modified Graflex Pacemaker Speed Graphic large format camera, circa 1966. A device mounted within the camera's bellows, labeled "████████ Corporation Hypnotic Pattern Generator", produces the item's anomalous effect. Research staff have determined that when light enters this device, it subtly alters the wavelength and intensity of individual photons and utilizes a dynamically generated diffraction matrix to embed anomalous cognitive triggers in the resulting image. The origin of the device is currently unknown, as "████████ Corporation" does not match the name of any business entity or subsidiary on record. The device requires six fully charged AA batteries to function properly. SCP-2626 was purchased at auction in San Francisco, California, from the estate of commercial photographer █████ █████████ after her death in 2004. The buyer surrendered the camera to local law enforcement after taking a photograph that caused him to vomit uncontrollably. According to him, it came in its original box with a note from a presumed acquaintance of █████████ that read: "A special camera for you on the occasion of your 75th birthday. Photograph only the most beautiful subjects with it, and I assure you that you'll appreciate the cool results. Best always, T.M." Viewing negatives or photographic prints produced by SCP-2626 will cause anomalous effects that depend on the perceived symbolism, function, or other properties associated with the subject depicted in the photograph. Additionally, the effects of a particular image may vary among viewers. For a complete list of known photographs and their effects, see Document 2626-L-01. Selected examples of tests on D-class subjects are listed in the addenda below. In each test, one or more D-class subjects were asked to view a photograph taken with SCP-2626 for 10 seconds. In all cases, the effect(s) manifested instantaneously after the photograph was hidden from view. Alpha Class Cognitohazards induce mildly incapacitating sensations or beliefs in some or all of those exposed. Effect: First subject, an atheist, reported a distinct sour taste in her mouth. Second subject, an avowed Christian, insisted he had been endowed with "knowledge" or "wisdom", but could not specify exactly what he had learned. Beta Class Cognitohazards induce moderately incapacitating sensations, beliefs, or experiences in some or all of those exposed. Effect: Temporary paralysis observed (approximately 10 minutes) among all viewers. Effect: Visual and auditory hallucination reported. Subjects believed they had watched one episode of a television show. Notes: Details of the show varied from viewer to viewer. (One subject believed he had watched a situation comedy about a pair of quirky roommates; another believed she had watched a procedural drama about police officers in Detroit, Michigan.) In each case, the content seen did not match any particular known television program, but rather contained scattered elements from multiple programs. Some viewers found the content more entertaining than others. Effect: Viewers believed they were intimately familiar with D-2626-14, despite knowing no details about him, including his real name. On viewing the photograph of himself, D-2626-14 experienced a major depressive episode in which he became very critical of himself and his perceived faults. Notes: Despite feeling that they knew D-2626-14, test subjects expressed no opinion about him, positive or negative. Effect: 25% of viewers experienced violent bouts of anxiety. 55% experienced prolonged restlessness, characterized by the need to pace around the testing room. 30% believed they intimately knew one or more of the human subjects depicted in the photograph. Gamma Class Cognitohazards induce severely incapacitating or painful sensations, beliefs, or experiences in some or all of those exposed. Effect: Viewers became highly agitated and physically hostile, demanded to know the location of D-2626-08. After viewing the photograph of himself in a separate room, D-2626-08 displayed a significant degree of undirected aggression. Effect: Viewers who smoked cigarettes expressed a strong desire to smoke. Viewers who did not smoke cigarettes screamed incessantly, some dropping to the ground and rolling back and forth, before going into acute shock. Effect: All except one viewer rendered catatonic and unresponsive to stimuli. The responsive individual, after crying hysterically for nearly an hour, claimed that she was trapped in her chair, unable to move for ten years, and that she knew the exact amount of time that had elapsed because all she could do was "watch the seconds on the clock tick by." Effect: First viewer simply reported hunger. Second viewer, a vegan, proceeded to bite, tear off, and consume the flesh of her own hands. Delta Class Cognitohazards cause death for some or all of those exposed. Effect: Death by stroke observed in 25% of viewers. Irreversible coma induced in 20%, and 15% experienced sensations described as "peaceful and relaxing." The remaining 40% struggled to breathe, as if drowning, but recovered after intubation by medical staff. Effect: Death by brain aneurysm observed after approximately fifteen seconds. Effect: Death by cardiac arrest observed after approximately fifteen seconds in all viewers except one, who experienced no negative effects and simply stated that she was "filled with appreciation for her ancestors." Notes: Unaffected viewer was of Mexican descent. Effect: All viewers developed cancerous masses in various parts of their bodies. Additionally, D-2626-19 tackled and held down D-2626-34, who attempted to fight him off as [DATA EXPUNGED] terminated by security personnel. Epsilon Class Cognitohazards confer anomalous abilities in some or all of those exposed. See Addendum B for details. On Thursday, September 14, 2006, research staff photographed SCP-2626 itself in a mirror using a remote shutter release. Upon taking the photograph, a loud series of clicks emanated from the anomalous device within the camera's bellows. Staff members were initially concerned that they had somehow damaged the device. However, subsequent tests demonstrated that it was not adversely affected. The resulting photograph did not depict SCP-2626 as expected. Rather, D-class test subjects have described it as depicting an elderly woman in ragged clothes sitting in an armchair with torn upholstery, staring and pointing directly toward the camera with her mouth wide open, as if she is screaming. In her lap is a camera that appears to be physically identical to SCP-2626. D-class test subjects who viewed the photograph produced in this test were exposed to an Epsilon Class cognitohazard. Approximately one hour after viewing the photograph, subjects gained the ability to produce cognitohazardous effects through vocal inflection and facial movement. ██ Foundation personnel were killed, and another ██ were wounded or psychologically impaired in the subsequent struggle. Two D-class test subjects, D-2626-44 and D-2626-21, successfully escaped from Foundation custody and remain at large.